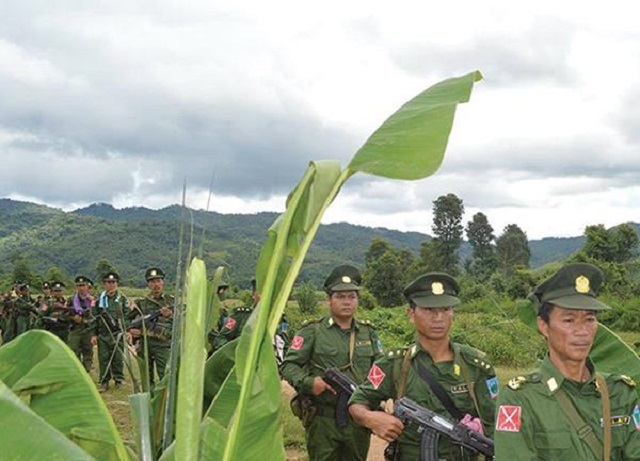 Civilians in northern Shan State have borne the brunt of the recent hostilities between Burmese government forces and the Ta’ang National Liberation Army (TNLA). Since November 2015, clashes have been regularly reported in the townships of Kyaukme, Namhsan and Marntong. Fighting broke out only a month after eight ethnic armed groups had signed a nationwide ceasefire agreement with the government, an accord which the TNLA was excluded from. Reached for comment, Maj. Tar Aik Kyaw, a representative of the TNLA’s News and Information Department, said that fighting has intensified during these last few days. He said that the Burmese army had advanced in the Ta’ang (or Palaung) militia’s territory, and that had caused the fighting. “More than 60 [Burmese] military trucks are now stationed in Muse and Kutkhai,” he said. He said that both sides were employing heavy weapons against each other near Mong Gaw. According to a resident in the area who wished to remain anonymous, fighting broke out when the Burmese government units reinforced their troops in the area. He added that local residents were faced with further hardship because Chinese traders were now refusing to buy their crops. The TNLA’s News and Information Department has regularly reported that government troops arbitrarily arrest, torture, kill and use local villagers as human shields in their battles against the Palaung militia. On October 27, Shan Herald also reported that a man was shot dead by a Burmese soldier in central Shan State’s Mong Hsu Township while he was driving his motorbike home.